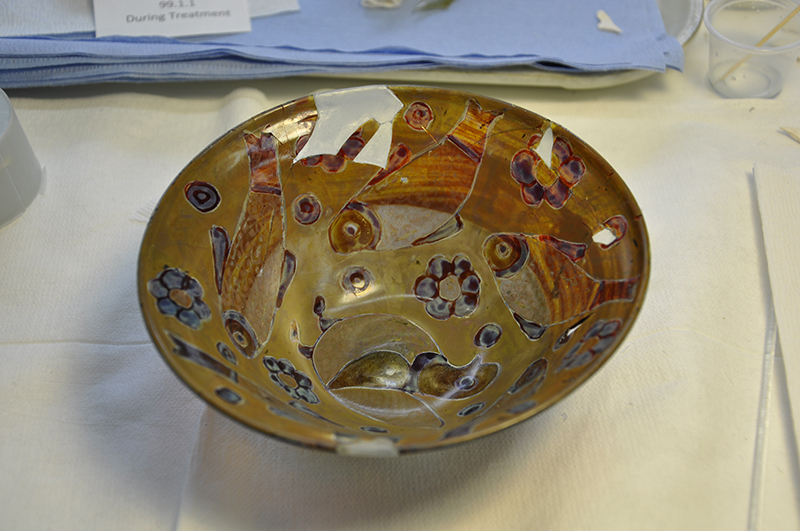 This Islamic bowl came into the lab for treatment when two previously glued fragments came loose during routine handling. The bowl came into the museum’s collection in 1999. The initial examination indicated that the previous repairs were starting to fail and a complete re-treatment was necessary. The bowl is broken into 28 fragments plus the base and has 6 losses, 1 larger, 4 small, and one very small one. The surface is in fairly good condition except for some damage near the losses which likely occurred during a previous treatment. The bowl was disassembled by immersing it in warm water for about an hour. This softened the adhesive (probably an animal glue) to a gel-like consistency which was easily removed with a scalpel and paper towels. A thorough cleaning of the break edges was done under the microscope. 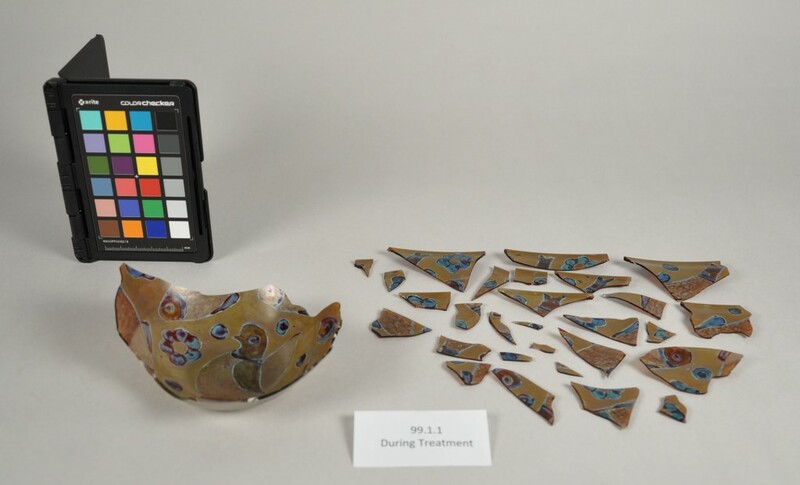 The bowl was then reassembled with a conservation grade acrylic adhesive. The numerous losses were filled in two ways. For the larger losses detachable tinted epoxy fills were made. This was done by first applying a protective coating of acrylic on the surface around the losses. Next plaster fills were made using a dental wax backing. The plaster fills were removed and the acrylic was cleaned off the glass with acetone. Silicone molds were made of the plaster fills. The molds were used to cast epoxy fills, tinted to match the color of the bulk glass. The epoxy fills were joined to the bowl with the same acrylic adhesive. 99.1.1 during treatment. Re-assembled with tinted epoxy fills. In addition to the detachable fills one small loss, two very small losses, and two partial losses as well as some gaps around two of the detachable fills were filled by direct casting with tinted epoxy. For the direct cast fills the break edges of the losses were first coated with a layer of diluted acrylic adhesive to make it easier for the fills to be removed in the future. The final step in the treatment was in-painting the fills to match the surface of the glass. This was also the trickiest part of the treatment. 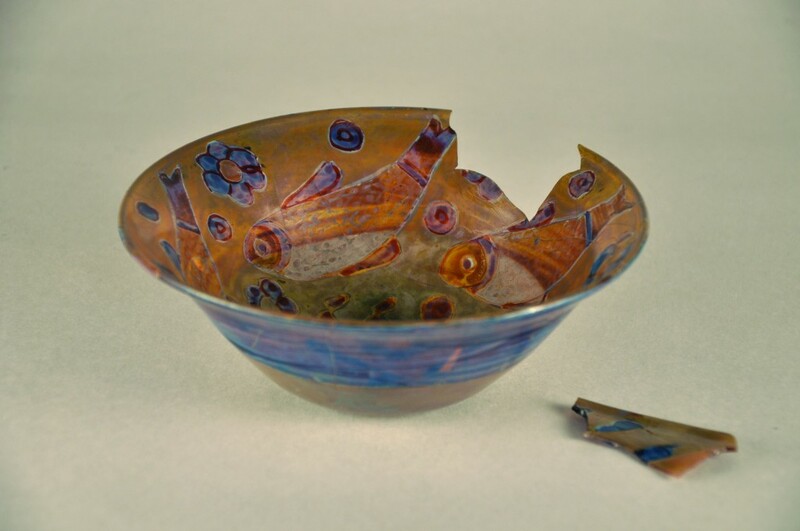 The luster decoration of the bowl is created by metal oxide stains that are fired into the glass. The change to the composition of the glass is localized and only affects the surface which means that the inside and the outside surfaces can, and in this case do, look different. Because the glass is also translucent the colors on one side effect the appearance of the colors on the other side and this changes depending on the lighting. To complicate the in-painting process even more, the acrylic paints that were used are not as translucent as the glass, especially when it comes to the darker colors which require more pigment. The treatment took a total of 44 hours. Come see the final results now on view in the museum’s 35 Centuries of Glass Galleries. Interesting post, thank you! A video of the process, edited, would be fun to watch. I would love love love to learn glass restoration!!!! I have my undergrad degree in art history, and my MFA in visual studies. I’ve always wanted to work in museums, and for a while (as a kid, 10-12 years old) thought about going in to restoration. Until I went behind the scenes at Corning and saw the tremendous effort that goes in to restoring works like this. So amazing, but not for me! Takes a very special hand and talent to do this! In dit museum waren we al een paar keer! Schitterend! De moeite waard!